The Fisher-Price Little People Disney Princess Songs Palace Play Set is on sale for $49.97 at Walmart.com right now. You can currently get a $10 Walmart Gift Card with purchase, making it just $39.97. This set is selling for almost $60 on Amazon right now! 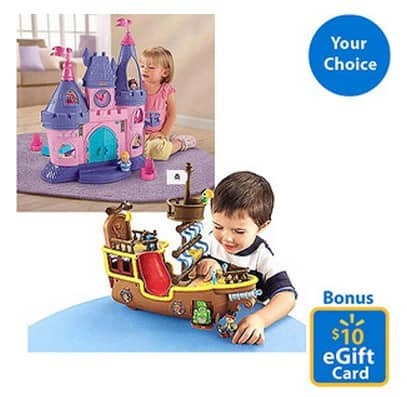 Or you can get the Fisher-Price Jake and the Neverland Pirates – Jake's Musical Pirate Ship Bucky for $34.97 after Gift Card.